"For A Good Cause, God Sends Help in Unfathomable Ways"
I was browsing my facebook, and a post stopped me... minutes of silence followed. "Prosperity of hospitals and pharmaceuticals depend upon the continued and new illness of patients and prescriptions of tests and procedures not required for them." It reminded me about a participant I was helping in translation. A senior lady working as a post woman, active and loved by all. She is diabetic, and two years back she went to a hospital and was advised medication. Once she started following the medication, she started developing skin infection. She consulted a physician and she was prescribed treatment for the infection. Once she started with the medicines, she felt breathlessness. A chain reaction of illness followed! She was delivering letters at Ashirbhavan, Kochi, as usual. That's when she heard about the Tibetan medical camp. Confused and exasperated from the series of medical misadventures, she decided to give a try. Now its more than a year, a regular participant at the camp, she got rid of the side effects and infections; she is afraid thinking about how one medicine led to a series of infections. Active with no tiredness, burning sensation or weight loss, with a good appetite, the last visit to the lab for blood test caused another stress. The technician at the lab asked her why she is not taking any allopathic drugs. She was advised to first bring down the values by taking allopathic drugs then to experiment with alternative medicine! Here is a healthy woman who fell prey to so called side infections undergoing treatment one after another, who got rid of the infections and is living a normal, healthy life. Now being warned to go back to a life of side effects and infections! Wellbeing is not about falling prey to drugs and a series of infections, one leading to another, it's about a drug free life, living a healthy life enjoying an active life and a natural smile. Every camp, looking forward to meet the smiling faces, interacting with them sharing the joy and sorrow of life, thanking participant who regularly brings delicious idly and mouth watering chutney, it feels like being part of a family, a home away from home. Keeping aside one's worries about illness, supporting other participants who are in much need, some participants spend more time at the camp, volunteering! They say it gives them immense happiness, hearing it gives me a sense of joy. 'For a good cause, god sends help in unfathomable ways.' - Shri Yeldtho Mathew, Campaigner, Friends of Tibet. I was sharing this story with a good friend and fellow volunteer Shri. Yeldtho Mathew when he said this beautiful quote. So true. While preparing for WB40, we received a request to volunteer. Ms. Victoria Sheldon is a PhD student from Canada. 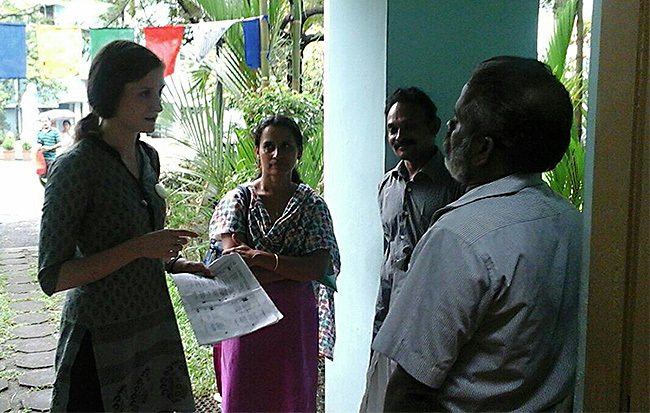 She is living in Kerala for a few months and she heard about the Tibetan medical camp and wanted to volunteer! She ended up being the star of the camp, interacting in fluent malayalam with all participants, coordinating and guiding them, comforting some, asking their experience. It was a delight to see her volunteer, infusing more positivity in the beautiful environment of the medical camp. Tibetan medical camps also is a meeting place for the countable tibetan population at kochi. Namgyal Tsundu a tibetan businessman is a regular at the camps. Speaking fluent malayalam, he spends time at the camp interacting and translating. One of the days we met at his residence for a sumptuous dinner. The discussions always take a beautiful turn towards Rangzen*, hoping one day they can go back to where they belong; staying in a place they do not own and forced to be away from a place which is rightfully theirs. Often people ask me why Tibet, when there are lot of issues to be focused here. Deprived of land, which is theirs!